Mankind as species has the moral imperative for the advancement of each individual’s power to affect change in and over nature; this goes for all—not just part—of mankind. The natural consequence of this is that the power consumed per capita must rise over time, as seen in the example of the economic history of the United States. 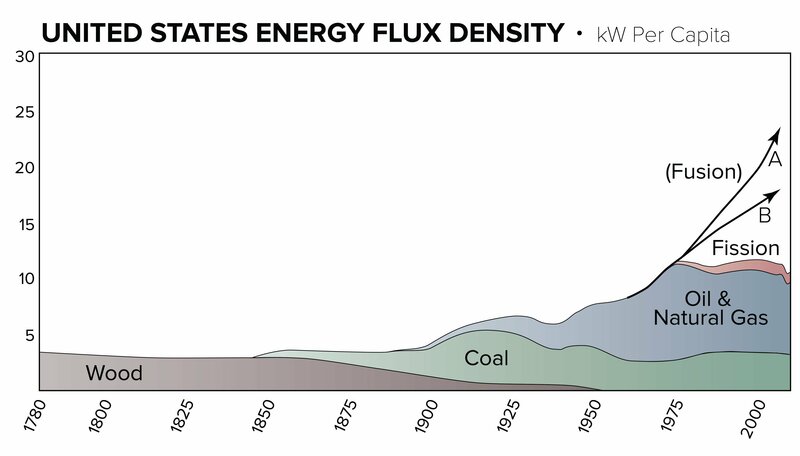 The energy flux density per capita in the U.S. has risen at an exponential rate since our independence. This is due to the use of higher forms of “fire”—wood, to coal, to oil & natural gas—which accompany leaps of discovery of new principles, and the use of new technologies. The fact that the “fire” of nuclear fission was never allowed to be fully implemented is seen in the leveling off of EFD per capita seen around 1975. The two lines labeled “A” and “B” are different projections of where we should have been by now, if fusion power had been allowed to develop on the originally-projected schedule. For all of the more-than 7 billion people on Earth today to enjoy a standard of living exhibiting the potential advantages of currently existing technologies, the world power consumption must be 10 times its current level. No amount of burning fossil fuels can successfully meet this demand. We must turn to the higher, more energy-dense forms of “fire” of nuclear fission, and especially nuclear fusion. But we are not merely interested in power applied on Earth. Exploration and development of our Solar system, mankind’s imperative, also demands that we wield the increased powers—both quantitative and qualitative—that nuclear fission and fusion can unleash. The key to meeting the requirements of mankind, both on Earth and in the Solar system? Lunar helium-3. What Is & Why Helium-3? For billions of years, the Sun has been depositing a special isotope of helium, called helium-3, on the surface of the Moon, which is estimated to have 1 million tons, or more, embedded within its regolith, or soil. On Earth, however, helium-3 is exceedingly rare.1The Earth’s magnetic field and atmosphere prevent the solar wind from depositing its rich resources on our planet, and so the main terrestrial source—the decay of radioactive tritium in nuclear weapon stockpiles—yields a measly 15 kg per year. Why is this important? As a fusion fuel, helium-3 offers specific advantages beyond any fuel accessible on Earth. In fusion reactions, two light nuclei combine to form a new element, and in doing so, release energy in the form of particles and electromagnetic radiation. While fusion, in general, is 100 times more energy-dense than fission, which is 100,000 times more energy dense than fossil fuels, not all fusion fuels are created equal. A fusion reaction of deuterium and helium-3 releases 18.4 MeV, more than any other fusion reaction available to us, and its products are almost entirely in the form of charged particles, rather than neutrons. Here are represented fusion reactions between four different combinations of fuels. Each reaction has a different energy yield, and different fusion products. Unlike neutrons, which don’t respond to a magnetic field, the energy of charged particles can be directly converted to electricity through magnetohydrodynamics (rather than a steam cycle and turbine), making the energy conversion twice as efficient as that of prevalent methods. Because of these characteristics, is has been recognized that lunar helium-3 could power the Earth for 10,000 years. But the promise of helium-3 can’t be fulfilled on Earth. For this, man will have to develop the Moon. 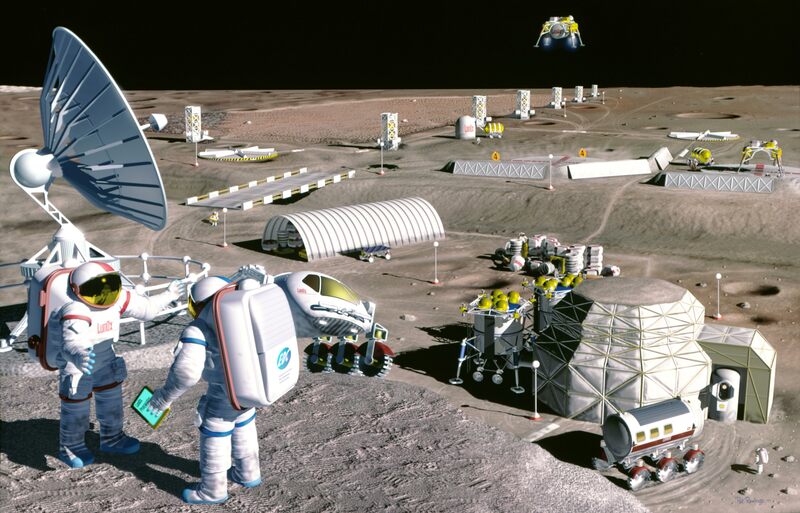 Many nations, most prominently China, are looking to the development of in situ resources on the Moon for the establishment of a “base camps” for Solar system exploration and development. Rather than bringing those resources from Earth, an expensive and limiting prospect, mining operations and industries can be established on the lunar surface to provide water, materials for construction, and fuel for power production to the scientists and others living and working there. Given the availability of helium-3 in the lunar soil, along with other advantages of the unique space environment,2The natural vacuum of space (a condition which must be artificially created on Earth) and low gravity may provide major advantages, both in reactor design and materials production, which could make a viable fusion power reactor much easier to achieve in space. it is possible that the first “commercially” operational fusion reactors will be on the Moon, rather than on Earth. Helium-3 is also a fuel with great potential value for rocket propulsion. Imagine making the trip to Mars in a rocket which constantly accelerated at the rate of 9.8 m/sec2 (1G). You would arrive there in a week or two, rather than months, thereby greatly reducing your exposure to harmful radiation, and would experience artificial “gravity” equal to that of the Earth. How much fuel would be needed for this? If you tried to take a chemical rocket, there wouldn’t be enough fuel in the known universe to get you there! Only with the use of fusion rockets does this idea become feasible. Convergent-Divergent (or de Laval) nozzle design, used in rockets to convert heat energy into kinetic energy for thrust. 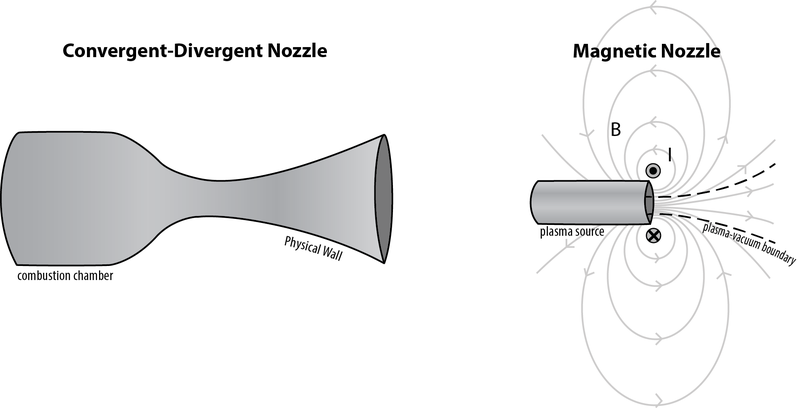 Since any material would be destroyed by the high temperature plasma of a fusion rocket, the nozzle shape is created by a magnetic field, which directs and accelerates the hot plasma to supersonic speeds. Work going back to the 1960s has proposed designs for fusion rockets which could provide an increase of specific impulse several orders of magnitude beyond the chemical rockets of today, with fuel that weighs just a fraction of chemical fuels. A good argument for fission and fusion propulsion. Here you see that almost all of the total weight of the Saturn V rocket that carried men to the Moon was chemical fuel! 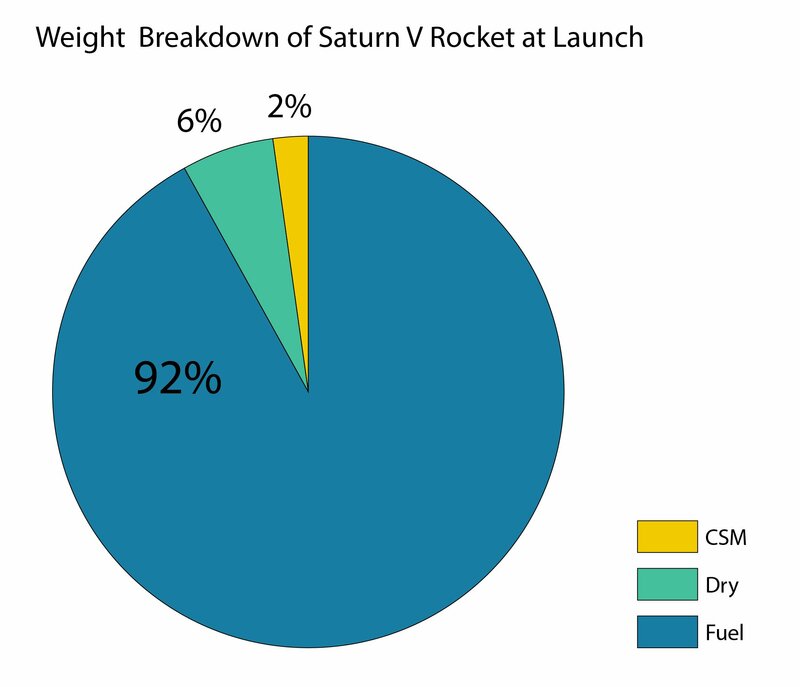 The "dry" (without fuel) weight of the rocket together with the Command/Service Modules (CSM), the vehicles that actually went to the Moon and back, make up just 8% of the total. There is water on the Moon, and there is helium-3, which is better than any other energy source existing on the Earth... One day, we will run out of oil and coal, and mankind will need energy. Then, we will start supplying it from the neighboring planet. The European Space Agency's “Rosetta” probe spent 10 years traveling from Earth to rendezvous with asteroid 67P/Comet Churyumov–Gerasimenko. This video shows the convoluted “shortest” path it took to get there, consisting of a series of gravity assist fly-bys of Mars and Earth, underscoring the need for fusion propulsion. This would revolutionize our access to the Solar system, making trips to distant destinations in the matter of weeks, rather than months or years, and allowing vehicles enough power to visit multiple distant destinations, rather than being limited to fly-bys.3For example, the 2015 NASA New Horizons mission to Pluto performed a close fly by of the celestial body, rather than entering Pluto orbit, because to order to slow down enough to be captured by Pluto’s small gravitational field would have required more fuel than was practical for the mission. This would, in a sense, “shrink” the Solar system from a vast kingdom which one spends years traversing, to a city, with its multiple planetary neighborhoods. Man is a species of perpetual progress for which resources are unlimited, because the mind’s power for discovery is unlimited. Today, we must make the next leap upward, and begin to realize the meaning of the Moon. The weight of the Saturn V rocket, which took man to the Moon, averaged 6.5 million pounds at liftoff! How much of that was fuel? Correct, 92% ! (That’s over 521,500 gallons!) The remaining 8% is the “dry” weight of the rocket itself, 6%, and the Command and Service Module (CSM), the only part that actually flew to the Moon at a mere 2%! 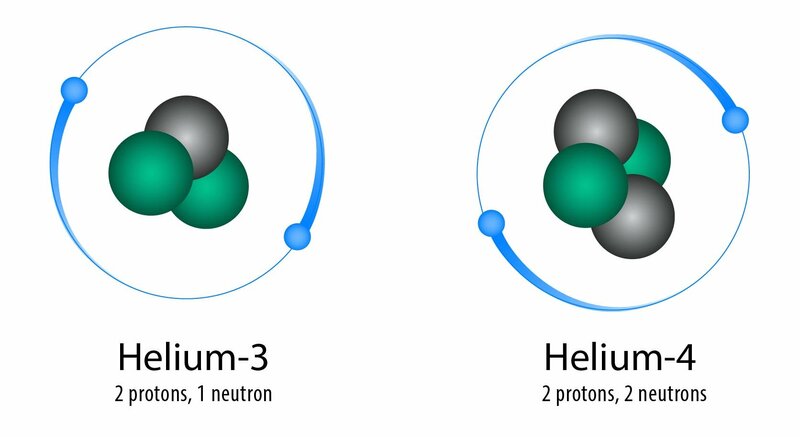 By Natalie LovegrenAs a fusion fuel, helium-3 has very unique characteristics which make it ideal for energy production, use in medicine, rocket propulsion, and much more. By Liona Fan-ChiangWith the rise of a new strategic alliance on the planet centered around the leadership of China and the BRICS nations, comes the potential for a scientifically valid conception of the creative nature of mankind to govern the planet—and beyond.